“Healthier” GMO Blood Oranges with Anthocyanin? According to a news article on Zeenews.India.Com, some British scientists reportedly genetically “improved” simple oranges and changed them into a healthier kind of blood oranges. Such oranges, they insisted, could be mass produced and at cheaper cost. “Blood” oranges are colored thus from pigments called “anthocyanins” which, according to some clinical tests, give powerful health benefits, like the anythocyanin found in purple corn. Among top benefits of this phyto-chemical is decreasing your risk of suffering a stroke, heart diseases, cancer, and diabetes, among others. The pigmentation is found in crops and fruits with blue, purple, violet, or red colors and which are observed to develop well only in certain climates. In the case of purple corn, the best varieties come from the high mountains of Peru, particularly Machu Picchu. Meanwhile, Norwich John Innes Centre researchers have pinpointed the gene causing the pigmentation and manipulated it to eliminate the need for anthocyanin to develop only in cold climates, said the Daily Telegraph. That gene has been applied into seeds into Valencia oranges and scientists hope to get the first results from this genetically modified plants by year’s end. This engineering of a cold-independent blood orange with higher anthocyanin cannot be done except through genetic engineering, said Professor Cathie Martin accordingly. Well, the sad part here is the need to use the GMO process just to produce blood oranges with anthocyanin. The much better alternative–if we’re talking of getting the benefits of anthocyanin–is just to get organic and all-natural purple corn varieties from Peru which are said to have the highest amount of anthocyanin compared to other crops or fruits. All purple corn farms in Peru are said to be organic, free from any chemicals, and most importantly, free from any genetic engineering. There has been an uproar against genetically modified (GMO) crops, particularly applied to corn, which certain sectors say is extremely harmful to human health. Even if these GMO crops are fed domestic animals, not humans, the meats and milk of these animals are consumed by humans in the long run. 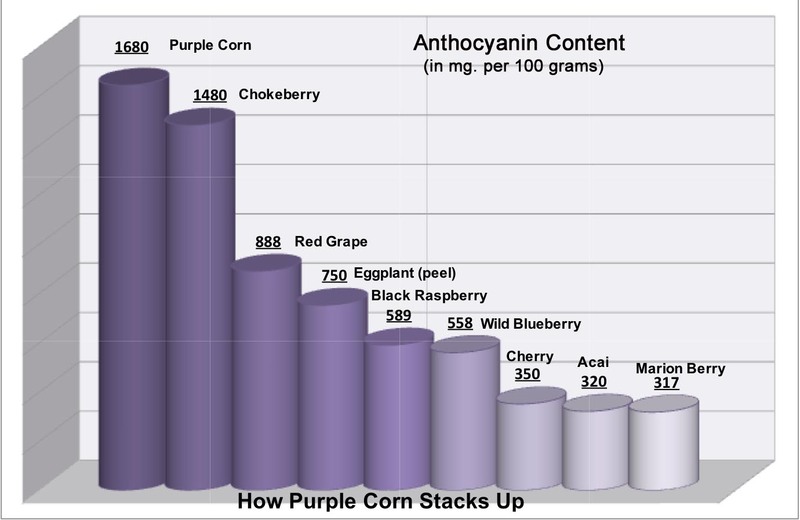 Purple corn from Peru is the safest abundant source of anthocyanin to date. The richest corn part that has lots of anthocyanin are the corn husk and cob which experts say give 80 percent of the phyto-chemical, compared to only 20 percent given by the corn grain itself. In view of the findings we have summarized in one recent article, how do we take purple corn supplements, like juice and capsules? Is it safe to drink any amount of purple corn juice, for instance, because of its zero toxicity? We have seen how clinical studies show that purple corn has no harmful toxicity, both to humans and animal labs. However, we strongly urge our readers to always abide by the law of balance–in everything, balance should be applied. Even drinking water needs a balance. Too much water in the body can also have ill effects. The same is true even with healthy foods. For instance, vegetables and fruits are good for you. But if you eat too much–or if you eat only veggies and fruits–you create an imbalance in your body which may result to some adverse health effects. Our bodies also need protein and calcium from meats and dairies. The same principle applies in the science of supplements. We can’t take any one supplement in massive amounts at one time. Vitamin supplements are good but we cannot abuse their intake. One disadvantage of drinking too much purple corn juice, for instance, is getting too much of its anti-inflammatory benefit. Our bodies need some property of inflammation to contain infection. For instance, the reason why your gums swell when your teeth have problems is to contain infection. Too much swelling is bad, but so is zero swelling. No swelling might mean your white blood cells are not working. Though purple corn has zero toxicity, we do ourselves a favor by taking just enough of it everyday. We recommend 50 ml a day if you are healthy. Or, you can probably treat yourself now and then to a tall iced glass of purple corn juice–something like 250 ml, one or twice a week. Don’t drink a whole bottle of it daily. And on more thing–drinking bottles of purple corn juice is a waste because you won’t benefit from its entire content. Each time you drink purple corn juice, you get about only 10 to 15 percent of the nutrition absorbed in your body. The rest is eliminated through urine or perspiration. So why waste your purple corn supplement?